Whether you want to enlarge your existing flock of ducks or you want to start a flock from eggs of a specific breed, hatching duck eggs is a rewarding experience. Hatching duck eggs yourself is cheaper than buying ducklings -- usually the eggs cost half the price of the ducklings. Some hatcheries allow you to purchase as many eggs as you like, mixing breeds for variety. Hatching eggs is not complicated, and you don't need fancy equipment. Your source for fertile duck eggs will be either a commercial hatchery, another duck owner or one of your ducks. To ensure that you'll hatch healthy ducklings, your duck eggs must be fertile and healthy. If the natural mother duck is hatching her own brood, leave her alone. Eggs you've purchased or collected for hatching with an artificial incubator or a broody hen should be clean and of average size. Store them for no more than 10 to 14 days in a cool, humid location out of direct sunlight. 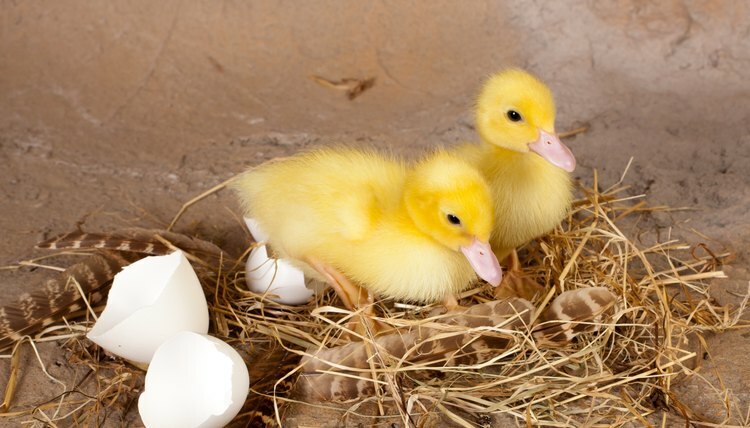 You'll need to decide how you're going to incubate your duck eggs to maintain optimum temperature and humidity for as long as it takes them to hatch. Depending on your situation, you can incubate your eggs by letting the natural mother sit on her own nest, by using an artificial incubator, or by using a broody hen as a foster mother -- the broody hen can be another female duck, chicken, turkey or goose with a strong mothering instinct. If you're using an artificial incubator, turn it on at least 48 hours before use. Temperature should be 99.5 degrees Fahrenheit; relative humidity should be 55 percent. Incubators available at retail range from simple to sophisticated -- follow the instructions included with yours. If you're using a broody hen, place her nest away from the rest of the flock so she isn't disturbed. Place all the eggs in the incubator or in the nest of the broody hen at the same time. Incubator eggs should be set on their sides with the large ends slightly raised. The eggs of most ducks -- including Indian Runners, Call Ducks and Pekins -- take about 26 to 28 days to hatch, while Muscovies require approximately 35 days. After the first 24 hours, you'll need to turn the eggs in your incubator three times daily to exercise the embryo and relieve stress. Around days seven, 12, 19 and 24, you'll remove each egg individually long enough to candle them -- shine a bright light through each egg to look for veins. Discard any that are clear or cloudy. Clear ones are infertile, cloudy eggs are spoiled. Listen carefully and you'll be able to hear faint peeping coming from the eggs in the incubator about 24 hours before the hatch. It takes about 24 to 48 hours for duckling to emerge, wet and exhausted from the shell. The newly hatched babies should remain in the incubator four to 12 hours longer to dry off. As soon as they have dried off, you can transfer your ducklings from the incubator into a clean container with soft bedding and sides at least 6 inches high to keep out drafts. Provide food and water.